It could be likened to a title fight, a comeback full of optimism. That’s the way to sum up the return to racing of Lautaro who makes his way back for his first official race start after a year out of the “ring” at Wagga on Sunday. It’s little wonder trainer Andrew Dale and Lautaro’s owners are keen to see what the now seven-year-old can do, but firstly this start will improve the fitness of the gelding. Lautaro won the 2016 Country Championship qualifier at Albury at his first start back from a spell and this time has had the benefit of one trial. Premiership winning jockey Nick Heywood will be aboard Lautaro who faces a strong line-up in the SDRA Winter Hcp (1400m). Race fitness is against Lautaro whereas his main rivals have the benefit of racing and will have the edge in that department. 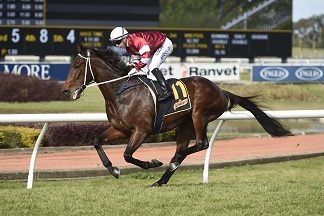 Lautaro in action at Rosehill Gardens. Credit: Bradley Photos. However, Dale knows the qualities of Lautaro who is on the comeback trail after surgery to both of his knees. “He has been tested against better quality horses and performed well so we know what he can do,” he said. “We hope he gets back to somewhere near his best so we can hopefully get him into better races. Stable mates Greipel and Marchello both enter the race third-up from spells, while Man Of Peace has the recent statistics to win at his home track where he excels. Man Of Peace has won five times from 15 starts at Wagga and last time out finished third behind Itsa Fait Accompli and Willy White Socks in the Narrandera Cup. Itsa Fait Accompli confirmed the form winning at Canterbury on Wednesday, while Willy White Socks took out the Forbes Cup on Monday. Willy White Socks will line-up on Sunday and has excelled of late as he pushes towards $200,000 in prize money. Meanwhile, Victorian trainers Anthony Freedman and Patrick Payne will create a lot of interest with their horses on Sunday. Freedman will start High Mode in the Riverina Cup (3800m) while Payne will run Minnamosa and debutant Whicker. Freedman prepares Everest bound and former Wagga Town Plate winner Santa Ana Lane, while former champion jockey Payne trains Whicker for the Tait family. Payne formerly rode the Tait’s champion galloper, Tie The Knot, to three of his Group One victories. View the fields and form (including race replays) for Sunday's Wagga meeting here.